For the record this is my first time trying to document my baking.. and it’s harder than I imagined! I kept forgetting to take photos and then letting things sit too long because I was taking too many photos… I’ll learn as I go I suppose. This past weekend I had a few friends over to see my new apartment now that we’re all settled in. I decided to bake cookies because well, who doesn’t like cookies!? A few years ago I discovered Joy of Baking and I love trying out all the recipes they post. The cookies I made are a modified version of their “Everything Cookies” (you can find their original recipe here but be warned, it has raisins in it). 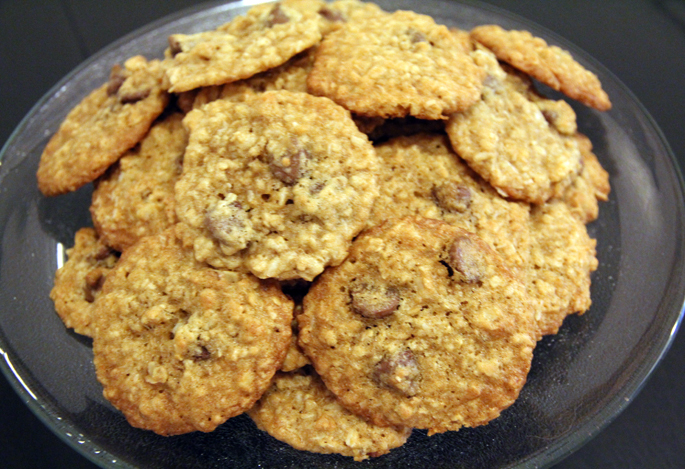 I love these cookies because they are easy to make and they always come out delicious. Give the recipe a try and let me know what you think! Preheat oven to 375 degrees. Line two baking sheets with parchment paper (or get really fancy and use a Silplat… I don’t know what I would do without mine). 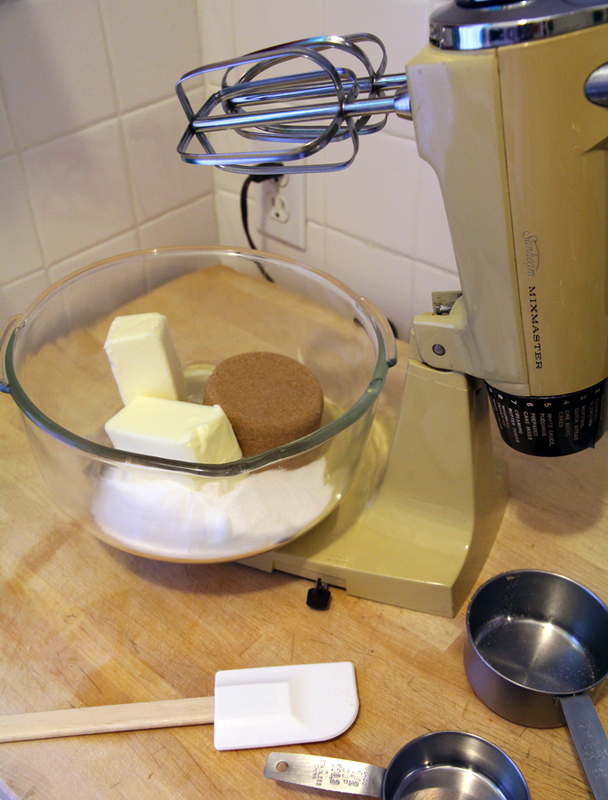 In the bowl of your electric mixer (or with a hand mixer), beat the butter and sugars until creamy and smooth (about 2 – 3 minutes). Add the eggs, one at a time, beating well after each addition. Beat in the vanilla extract. 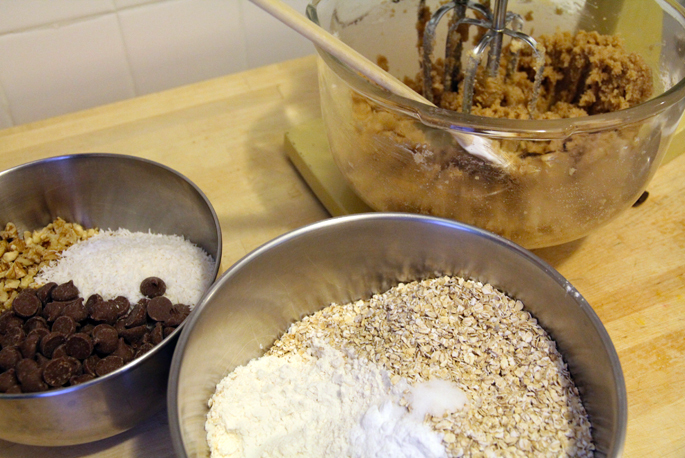 In a separate bowl, whisk together the flour, baking soda, salt, and rolled oats. 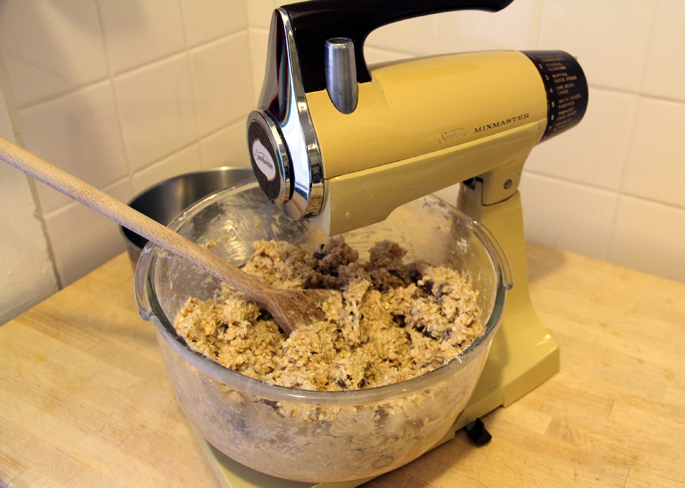 Add the flour mixture to the creamed mixture and beat just until incorporated (the batter will be sticky). 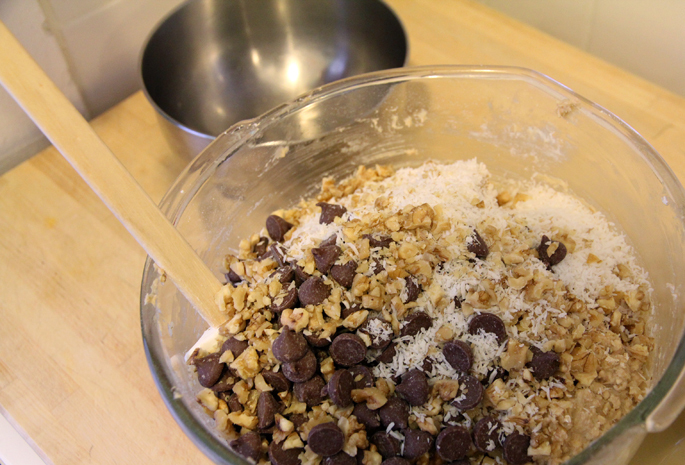 Stir in the nuts, coconut, and chocolate chips. 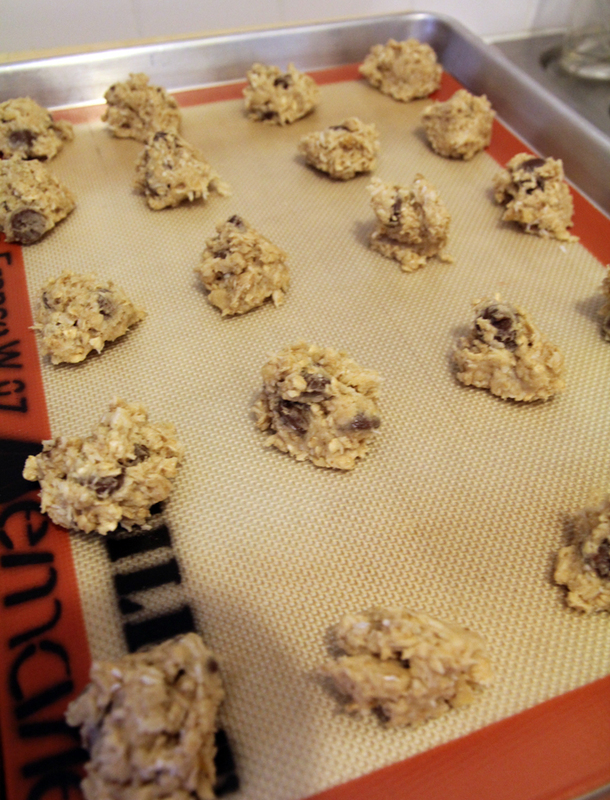 Drop the batter by tablespoonfuls onto the prepared baking sheet, spacing the cookies about 2 inches apart. 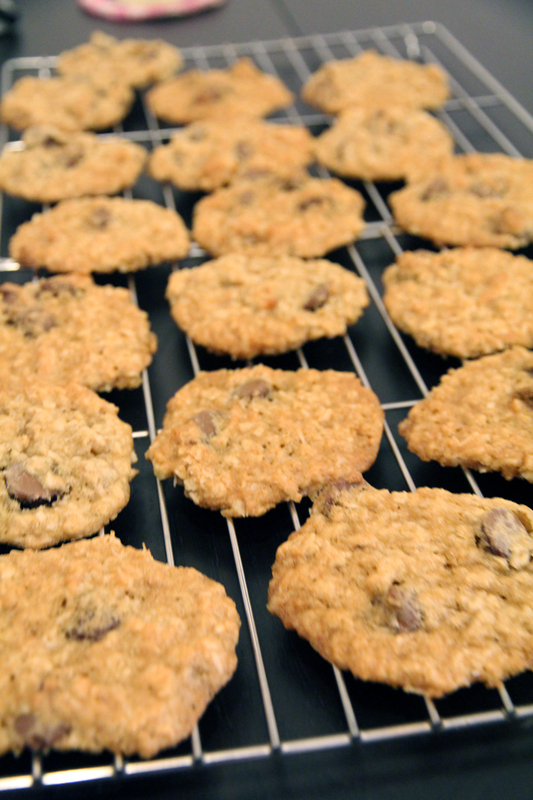 Bake the cookies for about 10 minutes or until golden brown around the edges. Remove from oven and let the cookies cool a few minutes on the baking sheet before transferring them to a wire rack to cool. Now all you have to do is try not to eat them all in one sitting. 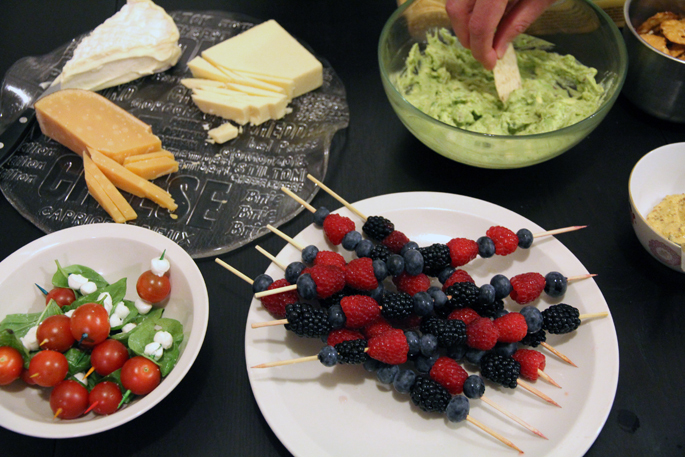 I made a few other snacks as well so we didn’t stuff ourselves entirely full of cookies. 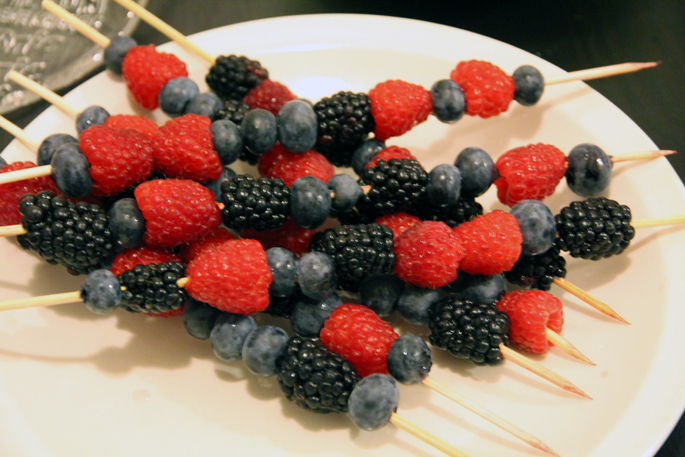 These little fruit shish-kabobs were super simple to make, but really fun and pretty. I will definitely be making these again! I’m going to miss all those lovely summer berries once the winter comes….it’s been a good summer of berries in my house. Those cookies look perfect, but I will admit to loving raisins 🙂 Definitely going to try the recipe!